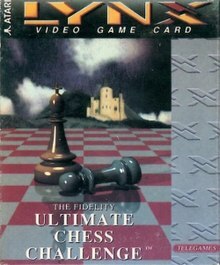 The Fidelity Ultimate Chess Challenge is a chess video game released in 1991 by Telegames for the Atari Lynx. Players can either play against the game or against another player using the same console. The game engine was written by Fidelity Electronics, makers of various chess computers, and reached a master rating of 2325 Elo. The program has 17 levels of play. Eight of them are time based level setting the average response time from 5 seconds (level time 1) to 4 minutes (level 8). The eight following levels restrict the program ability to look ahead. For example, level depth 1 restricts the program to 1 ply or 1 half move, level depth 2 restricts the computer to 2 plies or 2 half moves, and so on to level depth 8. The 17th level is an infinite level, the computation can either be stopped by the user or by the finding of a forced mate. Robert A. Jung reviewed the game which was published to IGN Entertainment, in his final verdict he wrote; "Telegames has made a respectable entry into the Lynx game market with this title. As a chess game, The Fidelity Ultimate Chess Challenge fits the bill. It plays a strong, challenging game, though it presumes some knowledge of chess on your part. The lack of a board set-up option, however, is inexcusable; it could have been added with very little effort. However, if you can live with this omission, and want to play chess on the go, then Fidelity Chess is a good solution." Giving a final score of 7 out of 10. ^ Robert A. Jung (6 July 1999). "Telegames makes a respectable entry into the Lynx game market with Fidelty Chess". IGN Entertainment. Retrieved 23 February 2019. This page was last edited on 23 February 2019, at 17:42 (UTC).